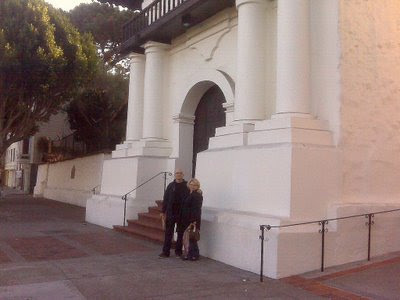 Tracy and I arrived at Mission Dolores at about 6 p.m.
-- as it was closing -- making this pilgrimage a quickie. 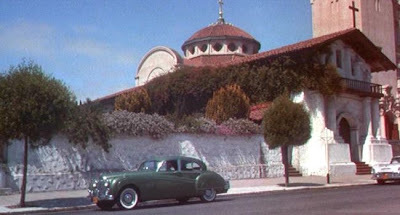 Exterior of Mission Dolores. 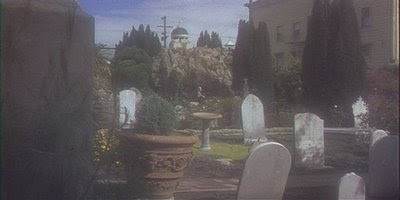 Hitchcock filmed this scene at around 8:15 a.m. So says the book California’s Missions (edited by Ralph B. Wright 1999). 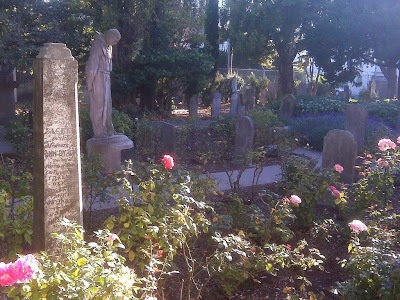 That was the mood I felt during a recent trip to the Bay area, when Tracy and I paid a brief visit to the cemetery at Mission Dolores, the oldest building in San Francisco. You can almost hear voices from the past whispering in your ear. Even with a camera phone, the light and atmosphere are beautifully haunting. "Madeleine" stops to listen to a voice from the past. 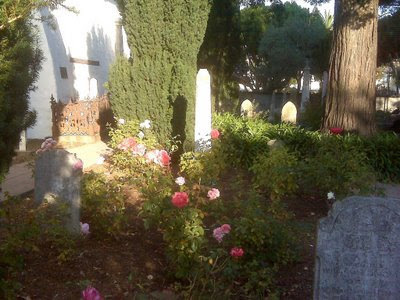 Though Carlotta is fictional, the cemetery at Mission Dolores where, in the movie, she is buried is filled with a who’s who of historic people, including the first governor of Northern California, Don Luis Antonio Arguello. This film prop remained in the cemetery for some years as a tourist attraction. What impressed me first about the cemetery was the light. Surprisingly, Hitchcock shot that haunting scene without resort to any special effects, yet it has a gauzy, dreamlike quality. From the moment Tracy and I stepped into that garden space, it felt the same way. We felt as if we were treading on special ground, and the mood was even captured, I feel, with my Blackberry camera phone. I also visited this sunday! What time were you there? 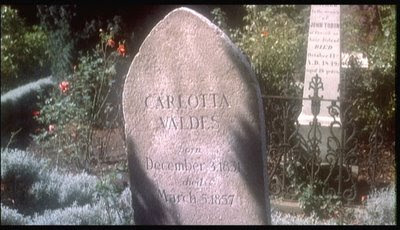 I have been to MD many times--I'm always struck how the light at Dolores remains so much like the images from Vertigo. Hello Ethan - We actually visited in early October. It just took a while to get around to uploading the pics. Sorry we missed you! Hi Dan - I should add that information about technical details behind the making of this scene, some of which appear in my post, can also be found in your excellent book "VERTIGO: The Making of a Hitchcock Classic". I thought I had burned out on Vertigo due to overexposure/overindulgence. I discovered that that is not really the case. When Harris and Katz did the restoration, they completely redid the soundtrack. They pumped up the volume of Herrmann's score and replaced nearly all the original sound effects with new sound effects. 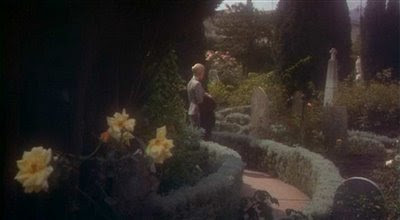 I found that when I watched Vertigo over the past few years, I was watching despite the soundtrack. I had such a negative reaction to the new soundtrack initially but I learned to live with it, despite the fact that it detracted enormously from my enjoyment of the film. I received The Masterpiece Collection for Christmas, and I just got around to running Vertigo over this past weekend. I already had it on DVD (the one that only featured the Harris/Katz redo soundtack and their audio commentary). When I put the box-set DVD of Vertigo in the player I noticed that there was a MONO audio option. When I chose that option I was surprised and thrilled to hear the original soundtrack to Vertigo with the original balance of music to dialogue and all the original sound effects. It was just like old times and I was able to enjoy the movie without any reservations. If you have one of the newer Vertigo DVDs I highly recommend the original soundtrack. The rooftop chase at the beginning is a great litmus test for the superiority of the original sound. A-B repeat the two gunshots and flip between the sound tracks to hear the difference. Also, A-B Scottie landing on the roof and sliding down to the gutter and compare the sounds. There are many such moments where the original foley is so obviously superior to the redo: Doors opening, car engines, newspaper rustling, etc. There are even sounds in the original that don't happen in the redo: When Scottie is waiting for Judy-Madeleine to come out of the bathroom you hear a car horn that is absent in the redo; When they're driving down to SJB at the end the tires squeal in the original, you just hear a car engine in the redo. I suppose for somebody who had never heard the original soundtrack this wouldn't be a very big deal. But for me, I am so thrilled that I can hear Vertigo as it originally sounded and as I fondly recall! I am putting on a Vertigo Festival and we are interested in you speaking. It is in San Juan Bautista in September. I would be very interested in speaking. Thank you! Feel free to contact me on Facebook (Joel Gunz) or joel.gunz [at] gmail.com.